The World of Warcraft is an expansive universe. You're plKnow Youaying the game, you're fighting the bosses, you know the how -- but do you know the why? Each week, Matthew Rossi and Anne Stickney make sure you Know Your Lore by covering the history of the story behind World of Warcraft. The story of Illidan Stormrage, born well over 10,000 years ago in the ancient city of Suramar alongside his brother Malfurion and their childhood friend Tyrande, would change the entire world now known as Azeroth. Without them, the Burning Legion might well have succeeded. The machinations of demons, the corrupt Highborne, even Queen Azshara were balked by this trio. But Illidan himself was often his own worst enemy. He is one of the greatest manipulators of arcane power ever to live, the first to ever seek to stalk and kill demons, a prodigy and a madman. He betrayed his own people in order to save them and the entire world, but he always served himself first. Selfish, mercurial, brilliant, resentful and tormented by himself, Illidan Stormrage helped make Azeroth everything it is today. Both of the Stormrage brothers underwent the tuition of Cenarius, the son of Elune and Malorne and a powerful Ancient. Despite the personal attention of a demigod, Illidan could not find in himself any real interest in the druid magics that Malfurion so excelled at. Illidan was far more interested in the arcane. If he also sought a quicker path to power in order to impress Tyrande, it was still his preference. The War of the Ancients changed everything for all three of them (and indeed for all Night Elves everywhere). The Kaldorei (as Night Elves call themselves) changed so utterly and so painfully as a result of this war that it's difficult for anyone who knows the Night Elves today to understand. Illidan grew to young adulthood among a people who tapped the Well of Eternity at the heart of Kalimdor for every possible use. The Well's power so suffused their civilization that those who were most in tune with the constant outflow of its arcane power were the rulers of their people, the Quel'dorei (Children of Noble Birth). Queen Azshara herself was born with the same golden eyes as Illidan, eyes that marked them both with a special destiny to the night elves of that time. We've talked at length about the war and Illidan's role in it before. For now, we can say that Illidan took part in the war alongside Malfurion and Tyrande, using his arcane powers and proving himself one of the strongest mages alive -- strong enough to succeed where those Highborne not seduced by Queen Azshara's madness failed. For it was the Queen and her advisor Xavius who had, in effect, declared war on their own people and even war on the world itself. They sought to keep all of the power of the Well of Eternity for themselves in order to use it to open a portal between Azeroth and the Twisting Nether and let the dark titan Sargeras wholly into the world. While their people panicked, they let Sargeras' demonic servants loose, in hordes almost uncountable. They stole the magic that Night Elf society had come to count on so that their people who have no means to defend themselves. In their hour of greatest need, the Night Elves saw the arcane magic they had so trusted fail them utterly. Combined with seeing Malfurion and Tyrande grow ever closer, it was a disaster for Illidan. He'd grown up believing that his golden eyes had meant a great destiny was in store for him, only to fail to measure up to his brother and the path of a new way for their people. Malfurion had the druid magics Illidan had rejected, and now he had Tyrande. As the war progressed, the dragon aspects were drawn into the fray, as well as the great Ancients, demigods long associated with the natural world. Illidan, already feeling himself pushed further and further out of relevance, took drastic steps to ensure he could still access sufficient power to help destroy the creatures of the Legion. He became a demon hunter, using power harvested from their deaths to help him kill more of them. Even this paled when those forces arrayed against the Legion saw the Earth Warder, Neltharion, turn on his allies. Having convinced them to help him create the Dragon Soul, an artifact of enormous power, he turned that power on the Blue Dragonflight, murdering most of them before the artifact's power began consuming him from the inside out. This one act nearly took the dragons entirely out of the War and left Illidan musing about what he could do with such power. He concocted a plan. True to his nature Illidan sought to prove himself superior to both sides in the war and ensure that no matter who won it, magic would survive. Defecting to Azshara's service, Illidan received the personal attention of Sargeras himself and survived the process. Sargeras burned out Illidan's eyes and replaced them with seething magical fire that could see all forms of magic, then marked his skin with the tattoos that would thereafter cover him, arcane sigils that would aid him in tapping fel energies. So altered, Illidan (along with Captain Varo'then, Azshara's stoic and loyal captain of the guard) went forth to find the Dragon Soul in order to add its enormous power to the ritual that would open the portal for Sargeras to enter Azeroth bodily. Illidan, however, had no intention of giving the Dragon Soul to Sargeras or anyone else. He would use the power of the artifact to slam the portal shut in Sargeras' face and prove himself Malfurion's superior by saving the entire world. In the end, Illidan's own arrogance meant that Varo'then managed to take the Dragon Soul back to the Legion's forces, and Malfurion was forced to reclaim it by walking the Emerald Dream for the first time. This ultimately led to the ultimate conflict at the Well of Eternity and forced Malfurion's hand; the Well would be destroyed in order to prevent Sargeras from using it to enter Azeroth. It's hard to say if this would have been necessary had Illidan not attempted to show up Malfurion in this manner. Since the Dragon Soul (by now called the Demon Soul) was the result of the Old Gods' driving Nelthariion mad, and the Old Gods since showed their influence over both Azshara and Xavius after they got hold of the artifact, it's worth wondering if Illidan too was so influenced. The Old Gods wanted to use the Demon Soul to hijack the portal Sargeras intended to use and walk the surface of Azeroth again. However, Illidan instead enacted his final backup plan. While the massive conflict raged over the Well, he managed to retrieve several vials of water from it. Thus, when Malfurion ultimately destroyed the Well and the power used to maintain Sargeras' portal, banishing the Legion back to the Twisting Nether. Illidan managed to recreate the Well atop the sacred mountain of Hyjal. In so doing, Illidan finally pushed his brother and his people too far. Having played both sides during the war -- having betrayed and counter betrayed everyone in his quest for personal power and aggrandizement -- this final act is too much. And yet without Illidan's actions, the world tree Nordrassil would never have existed. The immortality of the Night Elves and the pact with Ysera that created the modern druids -- none would have been in place. For his actions, Illidan would be imprisoned beneath the Barrow Dens of Hyjal. The Night Elves set the former priestess Maiev Shadowsong to watch over Illidan for eternity. Eternity, however, would eventually come to an end. After 10,000 years, the Legion returned to Azeroth in force. Night Elf society had changed greatly, forsaking the arcane that Illidan had risked so much to preserve. Yet when Malfurion and Tyrande came to the Barrow Den to awaken druids to aid in the defense of their people, Tyrande (now the High Priestess of Elune) would choose to end Illidan's confinement and went so far as to kill those guarding him in order to do so. After 10,000 years underground, it might have been expected that Illidan's bitterness over being condemned would have curdled his love for Tyrande, yet he agreed to help her. Was he hoping again to succeed where Malfurion had failed? Upon arriving in the demon-blasted Felwood, Illidan soon met a Human calling himself Arthas, an admitted servant of forces that opposed the demons for reasons of their own. He told Illidan of a powerful demonic artifact, the Skull of Gul'dan, and yet again Illidan sought out power. This time he attained it, draining the Skull dry and using its power to hunt down and destroy Tichondrius, the dreadlord leading the Legion's invasion in the area. Despite his unparalleled success in defeating the Legion, Illidan was confronted by Tyrande and Malfurion, and rather than being congratulated by them, he was condemned for his willingness to take the power of the Skull into himself, becoming as much demon as Night Elf in the process. Malfurion pronounced Illidan banished, and so Illidan and his power took no part in confronting the Legion atop Mount Hyjal. 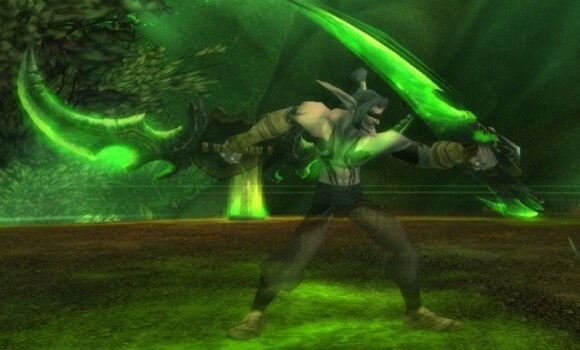 This despite the fact that the site was made by Illidan's actions and that if he had been allowed to fight there the Legion might have been balked without the destruction of Nordrassil. Illidan next surfaced at the Tomb of Sargeras, leading a force of Azshara's Naga (captained by Lady Vashj) in an attempt to reach the Eye of Sargeras. Illidan's familiarity with Suramar, the city the Tomb rested in, allowed him to beat his old jailor Maiev to the device, and he used it to collapse the Tomb on top of the Wardens while teleporting himself to the surface. Maiev herself escaped and contacted Malfurion and Tyrande, who pursued Illidan to the ruined city of Dalaran in the Eastern Kingdoms. Therein, it was revealed that without any ties to Azeroth itself, Illidan had chosen to ally to Kil'jaeden. The arch demon had chosen to overlook Illidan's role in balking Sargeras' invasion 10,000 years before as well as his killing of Tichondrius, because he saw the rebellious Lich King as a far more personal affront. So Illidan was attempting to destroy the Lich King on his behalf. Malfurion's interference led to Illidan's failure, but circumstances forced the two brothers to team up when Maiev's obsession with capturing Illidan nearly cost Tyrande her life. Illidan's actions in saving the woman he loved led to a kind of detente between the brothers. Illidan departed, but Maiev could not accept this. Throughout his attempts to first evade and then satisfy Kil'jaeden's demands, Illidan met Kael'thas Sunstrider, the descendant of the Highborn Dath'remar, and told the young monarch how to satisfy his addiction to arcane magic by tearing power from demons. 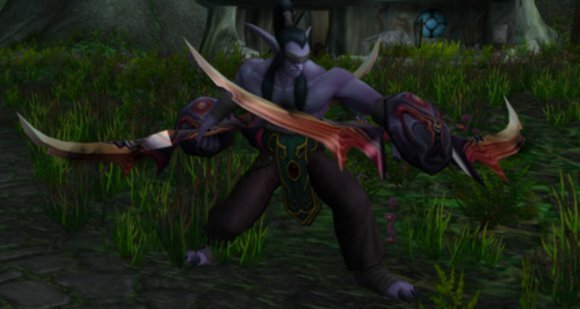 Having temporarily earned the Sin'dorei prince's loyalty, he led a motley force of allies (including native Broken Draenei led by Akama, a former priest in the Temple of Karabor) in seizing control of Outland for his own use as well as against the forces of the Lich King, going so far as to battle Arthas at the steps of the Frozen Throne itself. In the end, he was not successful, yet again letting the chance to save a world slip through his fingers. Illidan's forces retreated back to Outland bearing the gravely injured Illidan with them. In the end, this wound to his ego was one he never fully recovered from. Illidan chose to fortify his holdings on Outland for the inevitable reprisal by Kil'jaeden and the Burning Legion. He formed an army by using the blood of Magtheridon, the pit lord he'd defeated to become ruler of Outland, to create fel orcs and binding many of the old Horde of Draenor to his service as demon blood addicts. He struck out at the coming of the Naaru to Outland, sending armies to attack them, and he remained ignorant of Kael'thas' treachery as the younger elf "switched paymasters" from himself to Kil'jaeden. In the end, Illidan's arrogance yet again proved to be his downfall, as his ancient jailor Maiev Shadowsong (herself jailed by Illidan) joined forces with the Ashtongue Deathsworn under Akama and a band of mortal heroes sent by the Aldor and Scryers of Shattrath City to end Illidan's attacks. The Betrayer seemingly died betrayed himself, atop the former Temple of Karabor. Illidan's life was often tragic, an endless quest for power to prove himself worthy of the great destiny he often seemed to create by accident. Without him, the world would have been vastly different.